​Tasmania's most affable, goal kicking melodic punks, Luca Brasi, have stormed into #18 on the ARIA Album Chart with their brand new, triple j feature album If This Is All We're Going to Be. Today the band announce a headlining album tour for August, hitting the road with the UK's Moose Blood and Adelaide heartbreakers The Hard Aches. Beloved for their impassioned delivery and jaw-dropping work ethic, the quartet have really hit their stride with hard-hitting, confessional and sonically mature third LP If This Is All We're Going To Be. Having scooped up the mantle of triple j feature album on release, the record has earned Luca Brasi deserving praise from media and fan alike and is reflected in their stunning ARIA Chart debut. The Courier Mail branded the band “one of Australia’s most promising acts”, The Brag declared the record packed with “their strongest songs yet”. Musicfeeds hailed it the beginning of a “brilliant new chapter” whilst Rolling Stone declared it “for the ages: cathartic, euphoric”. Luca Brasi's unquenchable love of what they do is reflected in their tireless touring regime. Having entirely sold out their January single tour, the band will line-up alongside good pals and labelmates The Smith Street Band for a gargantuan (and nearly sold out, come on Perth!) tour through June before embarking on these national headline dates. Take a peek at the forthcoming Luca live experience in the video below, shot at recent house show hosted at the house of one lucky fan to launch the record. 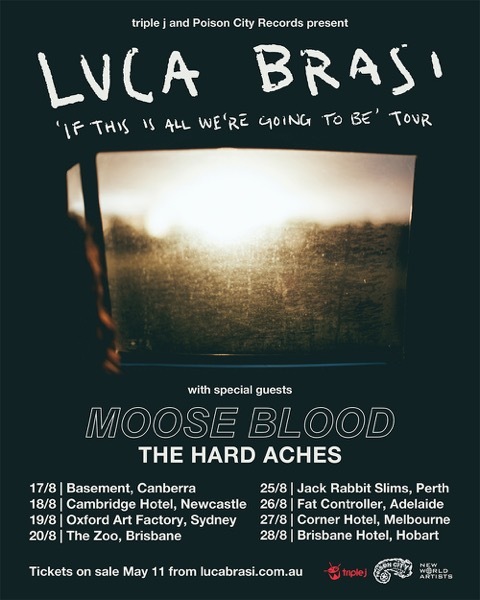 Bolstering the powerful presence of Luca Brasi on all dates will be Hopeless Records alumni Moose Blood, all the way from Canterbury, UK. Look no further than bombastic single Honey for evidence of the quartet’s deliciously catchy power pop. Equally sure to get some fists in the air are Adelaide party punks The Hard Aches. Rest assured that this tip top terrific trio of intrepid punk acts is going to make your last favourite show look like a Saturday night in watching Hey Hey It's Saturday (the new one) repeats with your in-laws. Tickets on sale Wed 11th May from the Luca Brasi website.